FIFA have demanded that the Nigerian government withdraw their ban on the Super Eagles playing international football for the next two years and given them until Monday to comply. 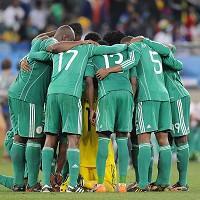 Nigeria's president Goodluck Jonathan has imposed the ban as punishment for the team's poor World Cup campaign. That contravenes FIFA's rules on government interference in the running of national associations. FIFA communications director Nicolas Maingot told a media briefing: "FIFA have sent a letter to the Nigeria Football Federation indicating that the government of Nigeria has until Monday at 6pm to cancel its direction to withdraw Nigeria's participation from all FIFA and CAF competitions for the next two years."